Is The Coffee Business Getting More Competitive? What's your favorite coffee shop? What’s your favorite coffee shop? 10 years ago, it seems like the only realistic answer to that question was Starbucks or Dunkin’ Donuts. At the end of 2003, the market size of the coffee industry was $8.96 billion, with those two chains absorbing the majority of that market. As time passed, smaller companies like Oren’s, Caribou and Peet’s continued to grow, expand, and chip away at that market. In 2011, the two big players combined for 50% of out-of-home coffee consumption in the United States. Today, the coffee industry is more popular and profitable than ever. In 2014, the industry is collectively responsible for $18 BILLION dollars in sales. Specialty coffee sales account for 8% of that total, and are increasing 20% year-over-year. Currently, 30 million americans drink a specialty coffee beverage on a daily basis. Recent financial reports show that Starbucks is more profitable than ever before, using some of that money to invest in an 80% faster WiFi infrastructure. That isn’t stopping small, boutique coffee shops from opening in New York City (and around the country) at a rapid pace. They’re taking their time to craft expertly made drinks and people are happy to wait, observe, learn and chat with the baristas while they do it. Imagine our surprise when locations #1 and #2 were the neighborhoods of the former and current offices of Techstars NY. 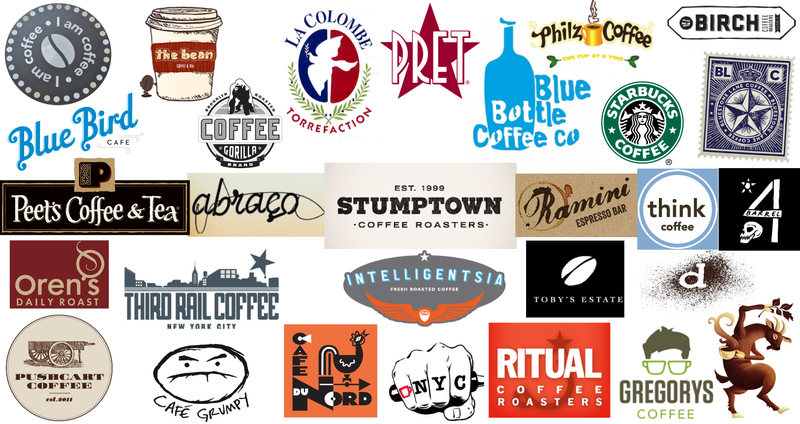 With such an abundance of options available, we had to know…where are people actually going to get a cup o’ joe? 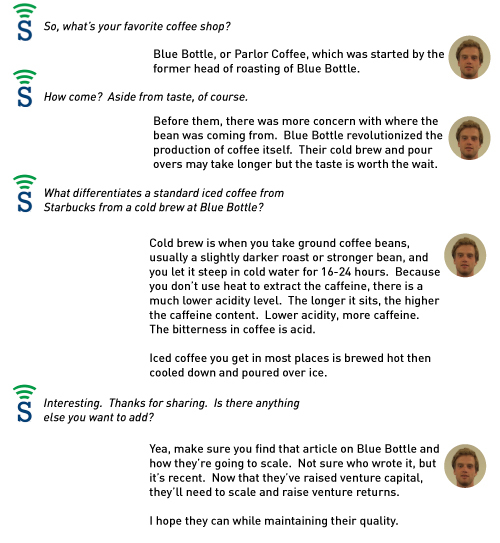 We sent a one question survey via email to our office and former accelerator colleagues, asking them their favorite coffee shop(s). Among the various entrepreneurs and colleagues we heard from, the five to receive the most votes were Blue Bottle Coffee, Starbucks, I Am Coffee, Toby’s and Gregorys. Are you surprised to see certain brands or shops on there? Surprised to see any missing? 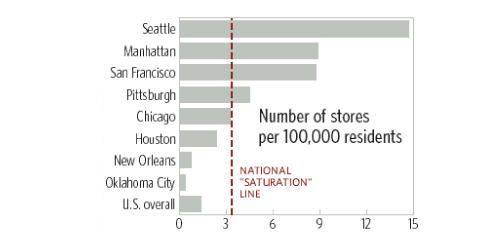 If it seems like the saturation of coffee shops in New York is extensive, we’re way behind Seattle, where there are almost 2X more shops. Even with all these options, however, the amount of coffee consumed in Europe puts our habit to shame. In Finland, the average person consumes WAY more coffee than the average American. Whether or not it’s a coincidence that all of Helsinki has free WiFi is something we’ll leave up to you. According to Skift, Finland has more or less declared internet-access a basic legal right. Even the Helsinki airport gives free WiFi to everyone inside, which resulted in a 3000% increase in users from 2009 to 2012. Helsinki, Finland Free Public WiFi in 2014. A majority of the locations are coffee shops and cafes. It’s easy to get lost in the numbers, revenue and size of the coffee business. So rather than focusing more on the billions in annual sales, we’re going to shift gears and talk to one of the people who answered our in-office survey. Nick Devane, first and foremost, is a coffee lover. There is more to him than that, of course. He’s a Wesleyan alumnus, a Hackstar in Techstars Spring ’14 class (how we met), and a co-founder (most recently, Parlae). Before he went to class in the morning during his college days, helped companies in our class build their dream a few months ago, or started building his own…he has a cup of coffee. Every day, on average, he has six. But this rate of consumption alone isn’t what qualifies Nick as a coffee expert. Before devoting his time to entrepreneurial endeavors for iOS, he owned and operated a coffee shop on the Lower East Side with two friends called Zulu’s. Its tenure, while short-lived, was well received by the community. Today, Nick still brews his own cold brew and sells it under the Zulu’s brand, using his own Toddy to do it. 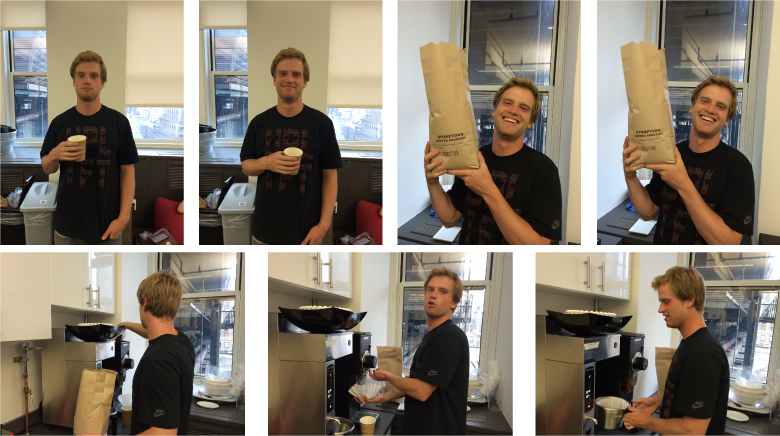 Given his experience, passion and expertise on the subject, we sat down with him in the 1407 Broadway office earlier this week to talk about coffee. It was over a fresh brewed cup of Stumptown Roasters Hairbender, the office bean of choice. The article Nick mentions was published by The Atlantic earlier in August 2014. If you’re interested in reading it, we tracked it down. It’s long, but a very interesting take on how to grow a business while still maintaining the principles that led to that growth in the start. With so many shops popping up and the business of coffee more competitive than ever, we’re curious to see how they will stand out from their peers. For Oren’s, they’ve seen success in partnering with other local NY businesses like Doughnut Plant to offer their baked goods in all locations. At SocialSign.in, we have a few other ideas for how coffee shops with a passion for their craft can thrive and retain customers in the short and long term. Free WiFi happens to be one of them. We’ve shown how coffee and the tastes of coffee drinkers have changed over time. As our focus on coffee draws to a close, lets go back to where this post started: the end of 2003. On December 18, 2003, The Economist published a story called the internet in a cup. The main point can be found in a quote at the very beginning. WHERE do you go when you want to know the latest business news, follow commodity prices, keep up with political gossip, find out what others think of a new book, or stay abreast of the latest scientific and technological developments? Today, the answer is obvious: you log on to the internet. Three centuries ago, the answer was just as easy: you went to a coffee-house. There, for the price of a cup of coffee, you could read the latest pamphlets, catch up on news and gossip, attend scientific lectures, strike business deals, or chat with like-minded people about literature or politics. The coffee-houses that sprang up across Europe, starting around 1650, functioned as information exchanges for writers, politicians, businessmen and scientists. We’re no strangers to a business meeting in a coffee shop. To learn more about how SocialSign.in can provide your coffee shop with a WiFi experience as thoughtfully crafted as your beverages, contact us today.